Every visitor of Austria′s capital will soon realise that there is a very big number of museums in Vienna - in fact, a lot more than anyone could expect from a capital of a country with a population of a mere eight millions. 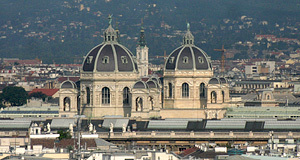 This is mostly due to the role that Vienna has played as the site of residence for the Habsburg Emperors and the nobility and clergy they have attracted. However, this tradition continues and even today, the collections of Austria′s museums are constantly extended and kept up-to-date. There are highlights, like the Kunsthistorisches Museum or the Austrian Gallery in the Schloss Belvedere that attract large numbers of visitors. However, for the small museums that target people with specialist interests, I thought it might be useful to provide an extensive list of many museums, including the less famous ones - and here it is, supplemented with the links to the appropriate websites. The museums are listed in an alphabetical order, I think the list is more or less complete. There are articles on TourMyCountry.com available for many of the following museums, in which case I have linked to them from the name. "TOP" highlights the biggest and - in my opinion - most impressive museums. A small museum dedicated to schnapps - the "national liquor" of Austria. A presentation of contemporary architecture from all over the World - since 1993. Museum of undertakers - in a cemetery-crazy country like Austria quite interesting. A study centre rather than a museum - on historic and contemporary designs, mostly from Austria. Dedicated to �artificial" languages - mostly Esperanto, but also Klingon and Tolkien′s elf languages.